After a rigorous selection process involving nearly 600 applicants, the City of Miami Beach Art in Public Places Committee has selected six internationally-recognized artists to create site-specific works of public art as part of a year-long initiative for the newly renovated and expanded Miami Beach Convention Center. These art pieces have truly become the crown jewels of the convention center. These installations form the core of what has been a year-long initiative; projects by Bill Fontana and Franz Ackermann were unveiled in the fall and winter, and the year will cap off with a major Elmgreen & Dragset sculpture in Winter 2019. The works in diverse media have been strategically placed around the site to enhance the experience of both convention center users and engage the greater public. These installations help solidify Miami Beach's reputation as a year-round arts destination, spanning far past just a week in December that tends to draw the art world elite. 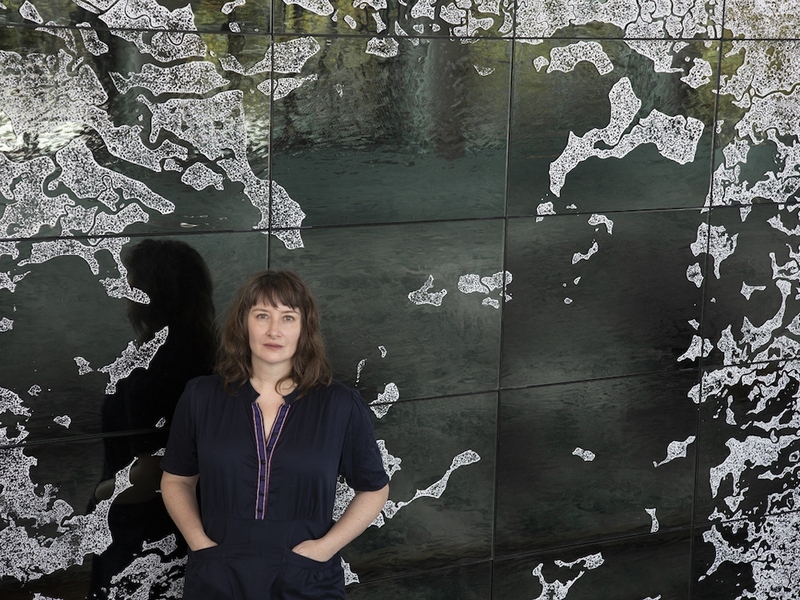 The artists—Franz Ackermann (Berlin), Elmgreen & Dragset (Berlin), Ellen Harvey (Brooklyn), Joseph Kosuth (London/New York), Joep van Lieshout (Rotterdam) and Sarah Morris (New York)— exemplify Miami Beach’s commitment to commissioning world-class public art. Produced with a municipally-funded percent-for-art contribution of $7 million, the initiative collectively represents the largest public art project of its kind to be installed on a single site in the United States history. These highly-integrated, significant works of public art are located throughout the new Convention Center. Located on the southeast corner of the Convention Center, Franz Ackermann’s About Sand is a dynamic hand-painted mural emblematic of Miami Beach’s multiculturalism, international tourism and global urbanism. While Elmgreen & Dragset will mark the greenspace at the west entrance with Bent Pool, a sculpture that turns a swimming pool into a monumental arch. The grand ballroom features Ellen Harvey’s Atlantis, a series of glass panels referencing Miami Beach’s unique connection to the countless bodies of water nourishing the Florida ecosystem. 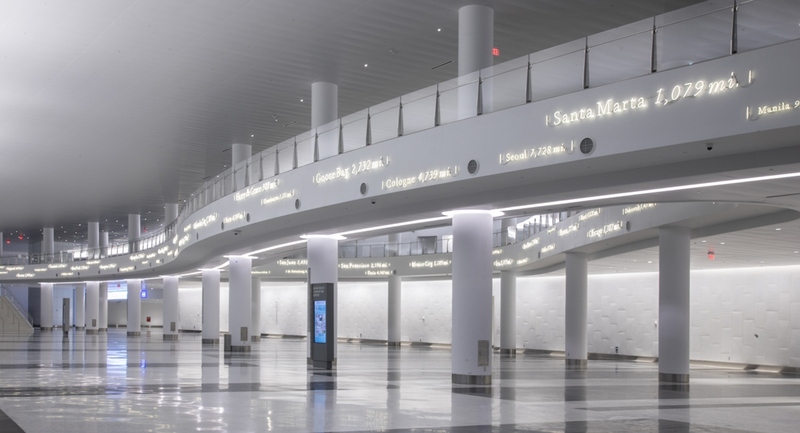 In the main lobby, Joseph Kosuth’s ‘Located World, Miami Beach’ brings a neon and text installation showing Miami Beach as the center of the world. Joep van Lieshout created Humanoids, a series of sculptures in the northeast Collins Canal park drawing from nature and the roots of humankind. At the northeast entrance, Sarah Morris connects three exterior walls with Morris Lapidus, a large-scale ceramic tile installation offering an evolving spectrum of color, geometry and organic forms. These works enhance Miami Beach’s public art landscape, home to an outstanding collection of Art in Public Places projects, including permanent work by Dan Graham, Roy Lichtenstein and Tobias Rehberger, among others.